Wine reviewers use a variety of terms to describe the characteristics of the wines they taste. While some of those descriptions are clear-cut, others may leave you hunting for a definition and wondering if "flabby" or "brooding" are good traits in wines. A glossary of wine tasting terms can help you identify the wines you want to explore. Acidity: The acidity level in wine is derived in two ways: the natural acids in the grape and the acids that occur as a result of fermentation. When someone is describing the "acidity" of wine, he or she is referring to how sharp or tart the wine tastes. When a wine's acidity is too high, its flavor is too tart and aggressive, but too low an acidity causes the wine to taste dull, bland and flabby. Aggressive: Wines described as aggressive are either too tannic, acidic or a combination of both. Angular: Angular is generally a term used to describe young wines that display predominately sharp, bitter or tart flavor characteristics. Astringent: If a wine is described as astringent, it means that it leaves the mouth feeling overwhelmingly dry. Wines that are highly astringent have a high level of tannins, acids or a combination of both. Astringent wines are often described as austere mellow as they age. Austere: A wine that is described as austere is a wine with crisp, but harsh, flavor characteristics. Austere wines are generally young wines with high acids, tannins or both. Awkward: Awkward is another term used to describe an unbalanced wine. This lack of balance may be between fruit and acids, acids and tannins or all of the above. Backbone: Backbone is a description that is synonymous with full-bodied and refers to wines that are well balanced. Backward: Backward wines are those that are strong in alcohol content and high in tannins. Backward is often used in the same manner as brawny. Balanced: A wine described as balanced is exactly what it sounds like and refers to a wine that is not too acidic, astringent, tannic or fruity. Big: The term big is used often to describe wine that is full-bodied and well rounded in flavors. Red wines described as big are usually high in tannins. Bitter: Bitter flavors are considered a flaw in wines. Blunt: Wine displaying strong alcoholic tastes and lacking in bouquet and aromatics can be described as blunt. Body: The term body is used to describe the weight and texture of a wine on the palate. It is most commonly used in terms of full, light or medium bodied. Bouquet: A term bouquet is used to describe the scents and aromas of wine. Some commonly used bouquet descriptions are vegetal, earthy and floral. Brawny: Brawny wines are young red wines with harsh tannins and high alcohol content, also referred to as briary and backward. Brawny wines are aged to help soften the tannins and mellow the alcohol content, resulting in a more elegant, well rounded wine. Briary: Briary is a term used to describe wines that are strong in alcohol content and high in tannins. Briary is often used in the same manner as brawny. Brooding: The term brooding is a positive description given to wine that is robust and very complex. Buttery: The term buttery is usually reserved for white wines, especially Chardonnay. The term is used to describe a white wine with hints of flavors and/or aromas of melted butter and toasted oak. Chewy: The descriptive term chewy isn't as un-appetizing as it sounds and refers to wines that are intense in flavor characteristics and are full-bodied. Clarity: Clarity is used to describe how the wine looks in the glass. It should be clear and bright and not have any indications of haze. Clean: Clean wines are fresh tasting and void of any off-tastes or odd aromas. Closed: Closed wines are generally young wines that could use additional aging, as aging helps to develop a wine's character. This term is used to describe wines that are lacking in aroma, color and body. Cloying: Cloying is a negative description generally given for sweet wines that are not balanced in acid structure, residual sugars and tannins. Coarse: Wines described as coarse have decent weight and texture (body) but are lacking everywhere else. Complex: Complex wines are those that display many different, perfectly balanced flavor characteristics and aromas. Creamy: Wines described as creamy have a silky and smooth mouth feel. 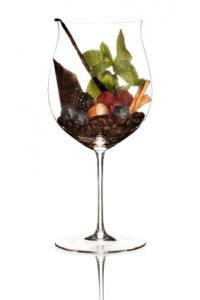 Dense: Wines are described as dense when they display concentrated flavor characteristics and aromas. Earthy: Earthy is a term used to describe both the bouquet and flavor of the wine and refers to a rich-soil scent or flavor. Earthy flavors and aromas are often imparted to the wine by the terroir in which the grapes are grown. Fading: A wine that is described as fading is losing color and flavor. The term is used to describe wines that are considered past their prime. Fat: Wines become fat when they are well-balanced and complex with a relatively low acid content. The term fat is generally a positive description. Finish: Often described as long, lingering or crisp, the finish of a wine refers to how long the flavors of the wine linger on the tongue and in the mouth after it is swallowed. Flabby: Flabby is a term that describes wine lacking in acidity and structure, causing the flavors of the wine to taste heavy and flat. Flat: First, there is flabby and then, there is flat. For sparkling wine and Champagne, flat simply means the wines have lost their bubbles or effervescence. For all other wines, the term is used to describe a wine that is boring and dull, lacking in flavor and aroma characteristics. Fleshy: Fleshy is used to describe wines that display smooth and rich flavor characteristics with a velvety mouth feel. Flinty: Flinty wines are generally high in acidity with a slight stony or mineral taste. 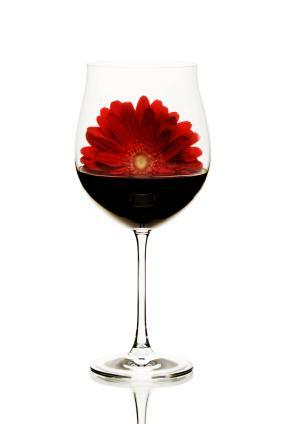 Floral: Floral wines have flavors and aromas reminiscent of fresh flowers. Forward: Forward wines display their flavor characteristics at the fist sip and often do not leave any lingering flavors. Fruity: Fruity wines display flavors and aromas of fresh fruit (other than grapes), such as blackberries or dark cherries. Green: Green wines are high in acidity and generally have unbalanced flavors. This term is usually reserved for white wines. Harsh: Harsh wines have high amount of alcohol content and the flavor characteristics are very astringent. Harsh wines are often aged in order for the wine to mellow. Heavy: Wines described as heavy are too high in tannins. Heavy wines are considered to be unbalanced. Herbaceous: Herbaceous wines have flavor and aroma nuances of fresh herbs. This term is generally used as a positive descriptive quality in a wine's flavor and aromas. Hollow: Hollow describes wines that are lacking in overall body and flavor characteristics. Hollow wines often have good flavor characteristics in the beginning and a decent finish, but lack in flavor characteristics in between the first sip and the finish. Jammy: The word jammy is used to describe red wines that display flavor characteristics similar to berry jam. Lean: Lean wines are lacking in fruit flavor characteristics. Length: Wine connoisseurs use the term length to describe how long the flavors of the wine stay in their mouths after it has been swallowed. The longer the length, the better the wine. Length is sometimes used in conjunction with finish. Light Bodied: Wines described as light bodied often lack in flavor and texture and are sometimes considered a little watery tasting. Lush: The term lush is used to describe wines that are rich and velvety. Masculine: Synonymous with muscular, the term masculine is used to describe red wines that are big, full-bodied, complex and well rounded. Medicinal: Medicinal wines have aromatic and flavor overtones of chemicals usually found in liquor such as Single Malt Scotch. Medium Bodied: Wines described as medium bodied do not have all of the well-rounded qualities of full bodied wines, for example, they may be a little too acidic or the finish may be too short. Moelleux: Moelleux is a French term (pronounced mwah-luh) used to describe white wines that have silky, soft and mellow flavor characteristics. Mouthfeel: The term mouthfeel describes how wine feels on the palate. Oaky: Wine with flavor notes of oak, often from being aged in oak barrels, is described as oaky. Oak notes often incorporate vanilla and sweet spices or a toasty flavor. Peppery: Peppery is used to describe wines that have nuanced spiced flavors. Shiraz often presents peppery flavor characteristics. Racy: Racy is used to describe wine that is high in acid content. It is generally used to describe young white wines. Robust: Wines described as robust are similar to big and full-bodied wines, but with stronger flavors and aromas. Robust is a positive descriptive term. Short: Wine in which the flavors disappear off your palate as soon as it's swallowed is described as short. These wines have virtually no finish or aftertaste. Silky: Silky is a characteristic description that refers to wine that has a very smooth and silky texture. A common French term to describe such wines is Moelleux. Smoky: Smoky is used to describe wine that displays flavors and aromas of smoked or charred wood. Steely: Steely is a flavor characteristic used to described wines that are aged in vats (usually stainless steel) as opposed to wood barrels. Straw: Straw is a descriptive term that is generally used to describe the color of white wine as opposed to the flavor or aromas. Supple: Wine that is well balanced with a soft mouth feel is often called supple. Tannic: A wine described as tannic often has a dry mouth-feel. The tannin level in a wine is caused by the seeds, stems and skins of the grape. Tannins soften as the wine ages. Vegetal: Vegetal is a term used to describe wines that portray vegetable characteristics in aromas and flavors. Velvety: Velvety wines are very well balanced in fruit, acidity and tannic structure. This term is synonymous with the term silky. Vigorous: Wines described as vigorous have strong, forward fruit flavors. Viscous: Viscous wines are full-bodied and dense. Wines described as viscous are also well balanced with very intense flavors. Volatile: Volatile is a negative characteristic used to describe wine that has an off-scent like vinegar. Zesty: Zesty is used to describe a wine with lively flavor characteristics with balanced fruit and acid.